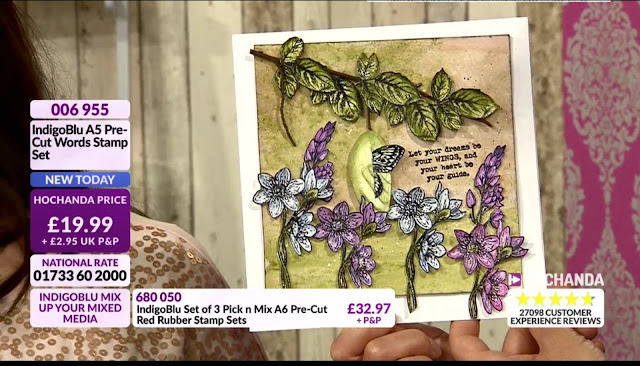 Did you see the lovely Kay on Hochanda tv yesterday? They had some truly spectacular offers on the beautiful Indigoblu stamps ! If you missed the shows you can still watch them on Hochanda tv online. 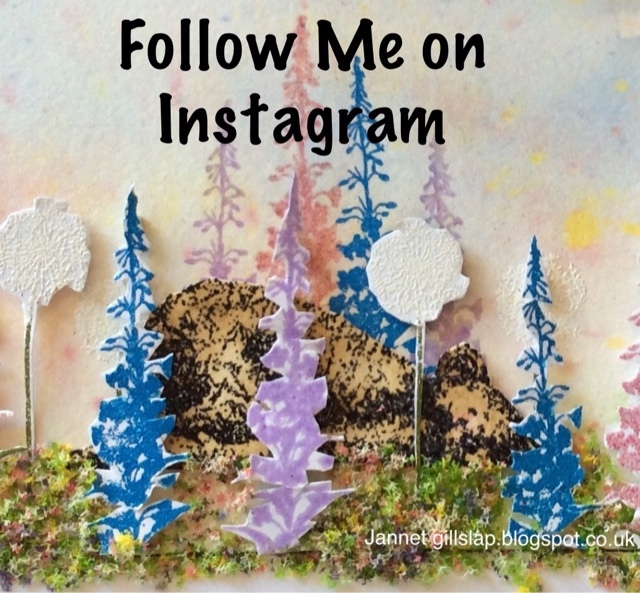 I have written a little step by step incase anyone was interested in how I made the card shown above. Butterflies are an excellent example that sometimes changes are good and can even be beautiful. Step 1. I painted Warm Tan paint over my 7x7 watercolour card, while still wet I crumpled up some copy paper and patted it down onto the paper, which left lots of interesting creases and textures. Step 3. I sketched the outline of a pupa shape and cut around it, and also cut a slit in the middle so the butterfly could escape. Step 4. I then covered the pupa with texture paste. I used the side of a palette knife to score some markings on the pupa.When dry I painted it with Peppermint Tea, and Olive Waistcoat paints. Step 5. After stamping and embossing half of the butterfly in Black, I lightly added some colour to her using Grandmas Teacup and Lemon Meringue paints.I fussy cut the lovely butterfly and slotted her into the pupa. Step 6. Black embossing powder outlined the flowers from the Anenome set and the leaves from the Live, Laugh,Love set very nicely, and I coloured them with the Marshmallow, Wimberry Pie and Pantry White paints. When dry I fussy cut all of the flowers and leaves. I then added some shape by curling the leaves and petals around a pokey tool, which gives them a more natural look. garden onto the background.I flicked several colours of paint over the picture to add some little dots of colour and interest. Step 8. As my blank card was white, I edged the watercolour paper using a black ink pad so it would stand out nicely. Step 9. A real twig was perfect to hold the leaves and the pupa.I used sticky foam pads to adhere the pupa, leaves, and the flowers which completed the picture. Step 10. To make the card stand out when it landed through someone’s door, I Stamped some flowers onto the corner of the envelope. Thank you for visiting, I hope you managed to get some of these gorgeous stamps! Try It On A Tuesday Natures Beauty Challenge. Happy Valentines Day and Winner Announcement. I will be having another giveaway at Easter time, there may even be some chocolate included ! Well February has snuck up on us, and that of course means all things love for Valentines. For my first Indigoblu project this month I decided to decorate these wooden letters, unfortunately I didn’t have a matching ”O” but I found a slightly larger papier mache one. I hope it works.... a few more details as are on the Indigoblu blog. Thank you so much for stopping by today, I hope you are well and having lots of fun crafting. I have lots to catch up on. 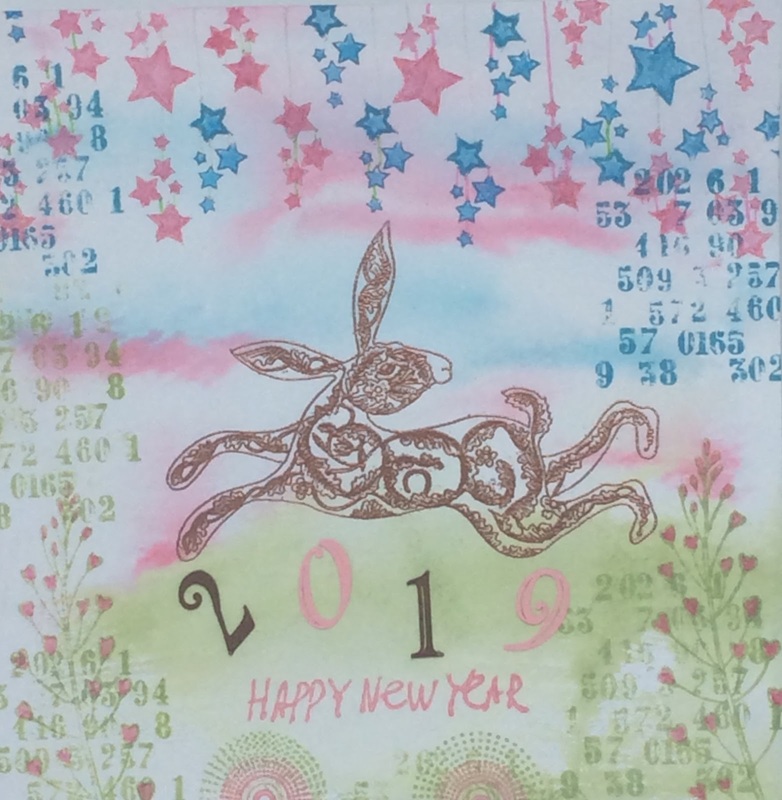 When I was resting I enjoyed watching all of the Creativation videos, it looks like there is lots of lovely new goodies coming out soon.I have never tried distress oxides, I really must, the new Tim Holtz resist spray looked interesting too. Did you spot anything, you are hoping to try? 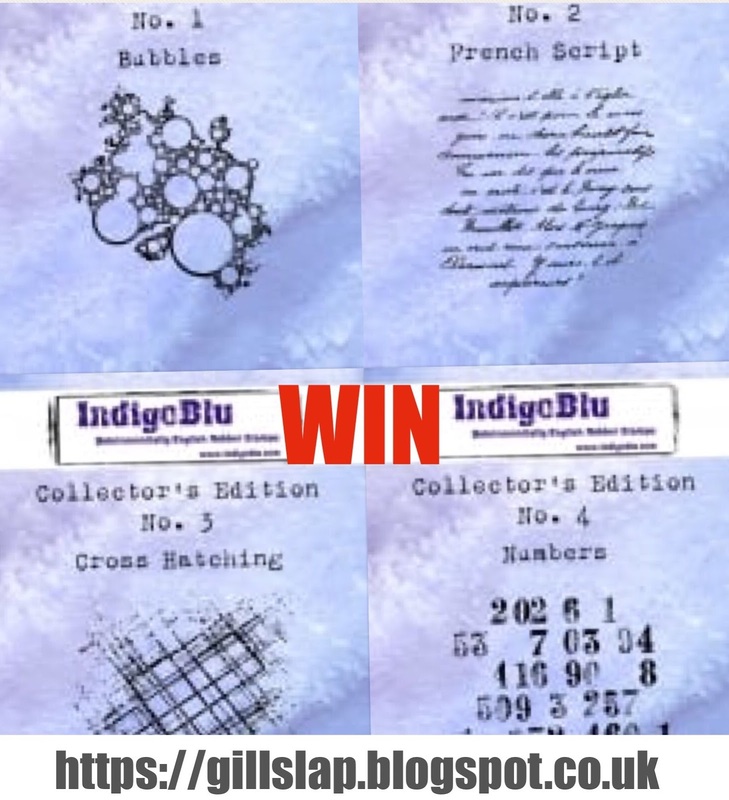 There is still time to win some fabulous Indigoblu stamps, click here for more information. I would like to enter my Love Letters into the following challenges. 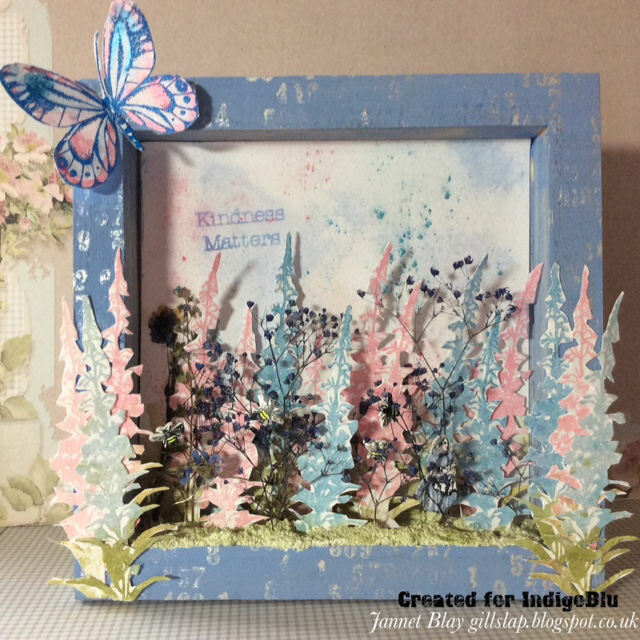 A Vintage Journey Melt it - Lots and lots of embossing powder on the letters! Hello, and if this is your first time here a very warm welcome to you! I hope you will enjoy your visit, please leave me a comment as I would love to visit your blog too. I hope you have escaped all of the nasty winter bugs going around, I am so looking forward to the spring! Today I would like to share my Floral Notebook with you, which I created for Indigoblu. 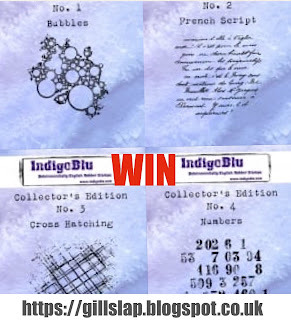 Indigoblu make amazing, unique and very high quality rubber stamps which are all manufactured right here in the UK. Their new floral stamps are just gorgeous and are a joy to colour ! This is how I created my notebook. 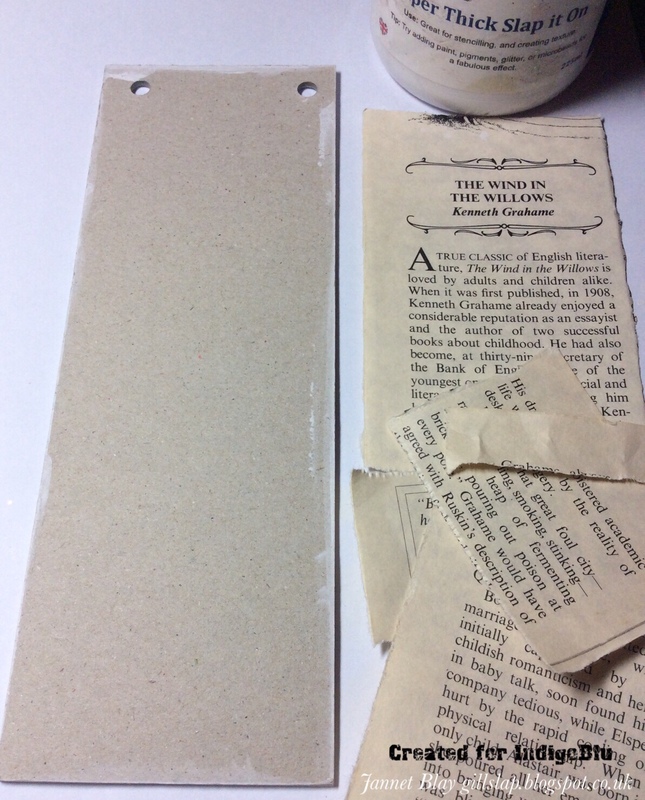 I removed some pages from an old book, this one happened to be “Wind In The Willows” I tore the pages into large strips, and adhered them to both sides of the notebook covers using Super Thick Slap It On. Using a Versamarker ink pad I stamped the flowers and heat embossed them with brown embossing powder. After colouring the flowers with Indigoblu paints I fussy cut them.I added some Mulberry Bush (this is my new favourite colour) paint to the edges of the notebook.I used sticky foam pads to adhere the flowers to the cover.I also added some pressed flowers to the cover. 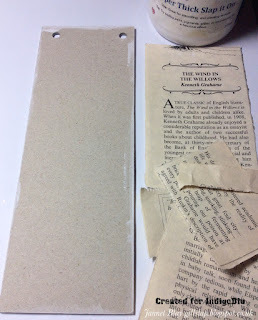 I tied ribbons and twine to the book rings, and then stamped the anemones on the bottom of each of the inside pages. I am thrilled and honoured to say that lovely Indigoblu invited me to stay on their Design Team for another year. They are all such lovely and talented ladies and gent.They have been very kind and understanding as I have developed another serious health problem, and I am currently boggled eyed with strong painkillers! Can you spot a shrunken Alice taking a stroll in her colourful and beautiful garden above? I painted the inexpensive wooden frame with Grandmas Teacup. When the paint was dry, I dabbed Snow White paint onto the numbers stamp, and I randomly stamped it around the frame. For the background, I cut a piece of Watercolour card to fit inside of the frame.I mixed Grandmas Teacup, Iced Gem, and Olive paints with some water to give it the fluidity of Watercolours. I spritzed the paper with water and added the washes of colour. When it was still wet I sprinkled the lovely luscious powders over the top.I also used paint to stamp "Kindness Matters" from the Mindfulness stamp set. I used paints instead of inks to stamp the flowers over the background.I also stamped some on another piece of card for cutting out. I used Stazon to stamp Alice and the bees onto shrink plastic, and shrunk them.Alice is of course used to shrinking! I adhered the bees to some twisted wire. After adhering the background inside of the frame, I added some Coarse texture paste inside the bottom of the frame. It held the flowers both stamped and pressed, bees and of course Alice in place. When dry I painted over the texture paste with Olive paint. I added some more flowers to the front of the frame. I stamped and coloured a beautiful butterfly, and sat her in the top left corner of the frame, where she could oversee events. You could also apply these steps to easily create a greeting card instead of a framed picture. 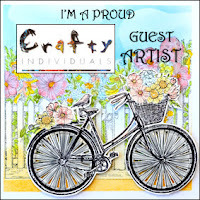 I am delighted and honoured to have been invited as a guest designer at A Vintage Journey.This month Amanda has chosen Watercolour as her theme.Which is of course my favourite colouring medium, it is very versatile and easy to use.Why not give it a try and join their challenge this month. I created a background with my watercolours and stamped this gorgeous girl blowing a dandelion stamp by Crafty Individuals. I always love to use elements from nature with my projects, so I found some pressed gypsophlia to use for the blowing away dandelion seeds. I am always finding forgotten pressed flowers in between the pages of thick books, where I have pressed them many months or probably even years before! I wrapped some threads around the base of the card and tucked some more gypsophlia between them. I finished the card by edging it with black ink, and adhering the picture onto a scalloped edged card. I would like to share this card with the following challenges. CAS Watercolour Challenge Salt I used salt on the watercolour background. I have always loved Alice In Wonderland, so I was very excited when I heard that there was a new immersive play happening at Waterloo Vaults. We went to see it as a pre birthday gift for myself! It was absolutely brilliant! Wheelchair users had to take a different route to everyone else, but I did not miss out on too much. It was great fun, apart from being soaked by Tweedle Dee and Tweedle Dum! I would always remember my happy day. I found this box at the Ally Pally craft show last April. I used pages from an old Alice book to line the little cubby holes, and for the inside roof I used the cover of the theatre programme, which featured alice falling down the rabbit hole. I used Indigoblu's gorgeous Grandma's Teacup acrylic paint to cover the outside of the box. I stamp and heat embossed white roses down the sides of the roof. To decorate the inside of the roof I stamped Alice and the White Rabbit onto shrink plastic, and then I gave them a drink from the bottle marked "drink me" and they both magically shrunk! The White Rabbit peeped out of the heart which I had outlined with a red glitter pen, and Alice sat on the shelf with the bottle, the Mad Hatters hat and a badge. In the first cubby hole sits a rose made of book pages and of course it had to quickly be painted red, so the paint inevitably drips over the side, the Queen of Hearts is overseeing the whole event. Tea is then taking place with a stamped teapot and cup on shrink plastic, and the all important jam tarts made of chipboard and then painted. The third cubby hole has a cover from a little Alice bar of soap which I had. The fourth cubby hole has a shrunken stamped Alice with a special clock which I cut out from the programme. The fifth cubby hole holds a special real postage stamp, it was produced for the year of the child in 1979.Sitting in the six cubby hole is Humpty Dumpty.I made him with paper clay, it is only the second time I have used paper clay, it has a very different texture to regular clay. I made the wall with chipboard and texture paste. The last line of cubby holes features a picture cut from a tag that came with an Alice umbrella, a raven badge given out at the theatre, some pictures fussy cut from an Alice quiz game, and the final cubby hole has some words cut from my Ace of Clubs travel permit card which I was handed at the beginning of my Alice Underground experience. I hope you have enjoyed visiting Alice and myself today, if you are coming to London this summer I highly recommend Alice Underground.